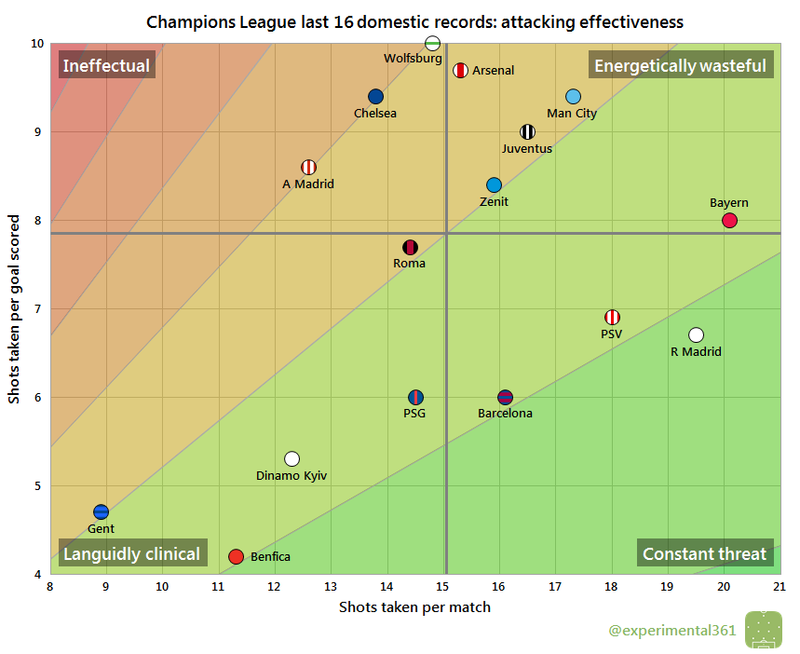 This post uses my scatter graphics (explained here if you haven’t seen them before) to compare the domestic records of the 16 surviving Champions League clubs ahead of the competition getting back underway this evening. 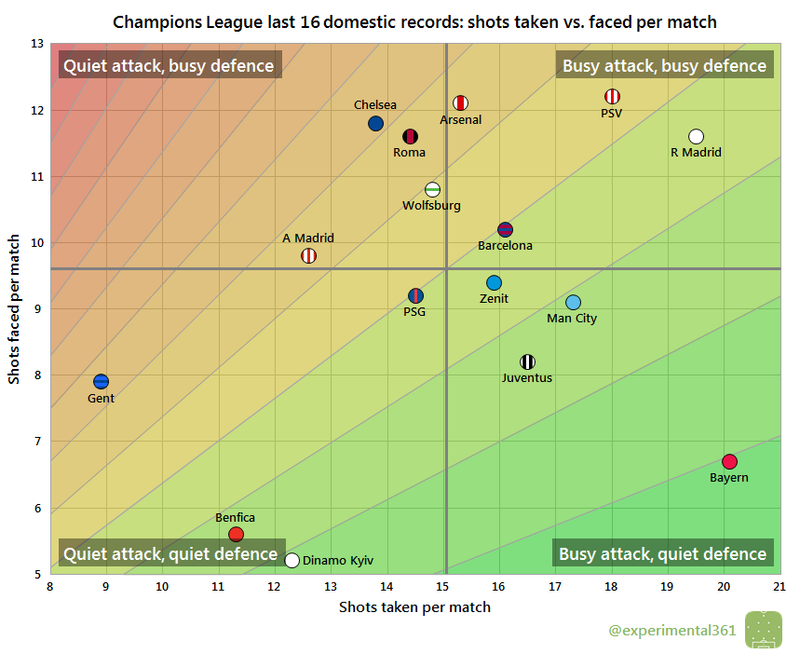 Clubs play so few Champions League matches that there’s not much point doing scatter graphics of the competition itself: even if the six group games were a sufficiently high number to draw conclusions from, the quality of the opposition can vary. I thought it might be more interesting to see how each of the 16 clubs has fared in their domestic division this season, which should give an indication of how they fare week in, week out. This obviously isn’t perfect either as the average Ukrainian or Belgian club probably won’t put up as much of a fight as the average Premier League or Bundesliga side, so I present this mainly as being “for interest”. I was able to get data for most of the competitions fairly easily, but it was a struggle to find sources for the Ukrainian Portuguese and Belgian divisions. I managed to find match-level shot counts on Soccerway (under “general game stats chart” in this example), but after adding them up they looked a lot lower than I was expecting. Either football is a bit more boring over there or the methodology used to capture data doesn’t catch all the shots. If anyone knows of any more reliable sources – or can confirm that these are accurate – then please let me know. 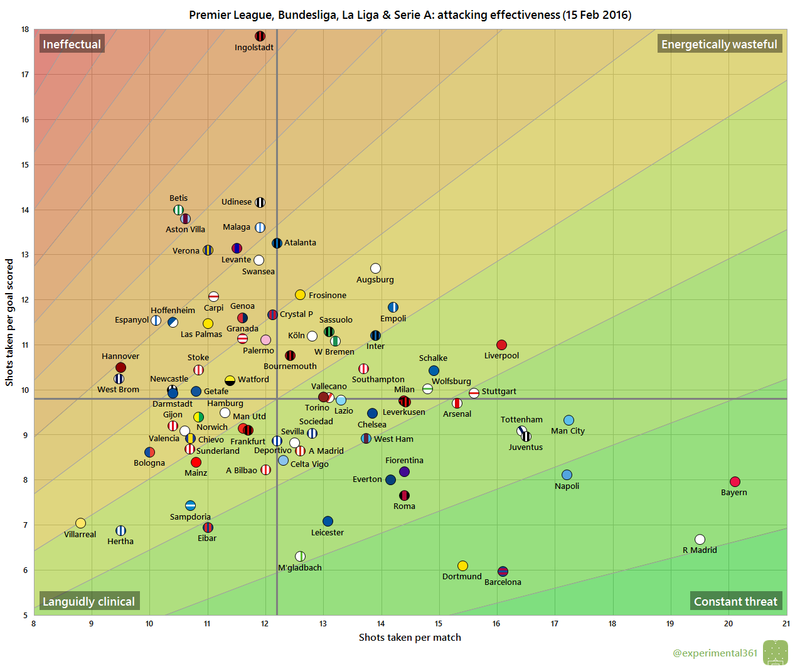 It’s worth flagging that the average lines which divide the graphic into four quadrants are based on these 16 teams. 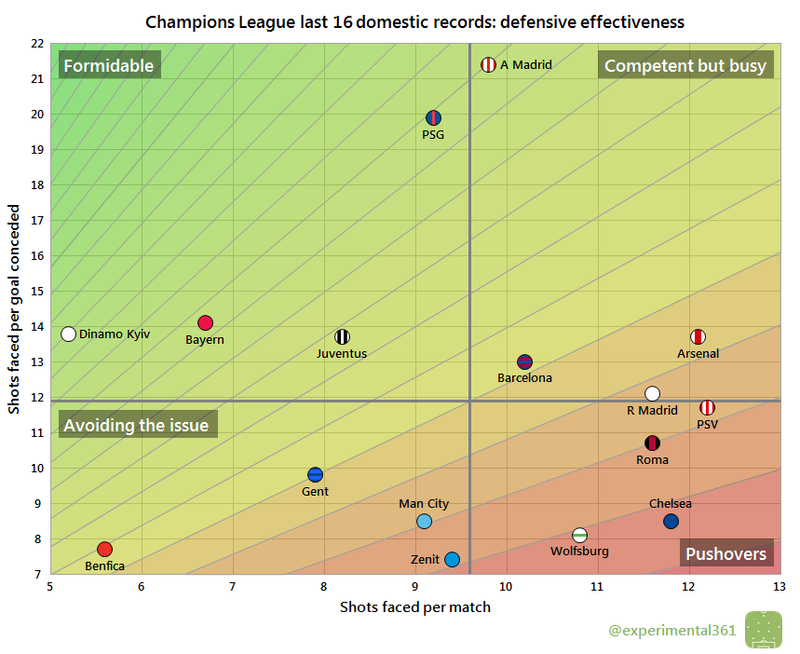 While Real Madrid are deemed to have a “busy” defence, this is relative to the other 15 clubs listed here: if you look at the standalone La Liga graphics you’ll see that they compare more favourably in their own league. Bayern have been the most domestically dominant of all the clubs remaining in the Champions League, having taken slightly more shots than Real Madrid and being almost twice as restrictive at the back. The next most dominant sides overall are Man City and Juventus, while only PSV have allowed more shots at their goal than Arsenal and Chelsea. Bayern may have created more chances than Real Madrid but the latter are more efficient at converting them. 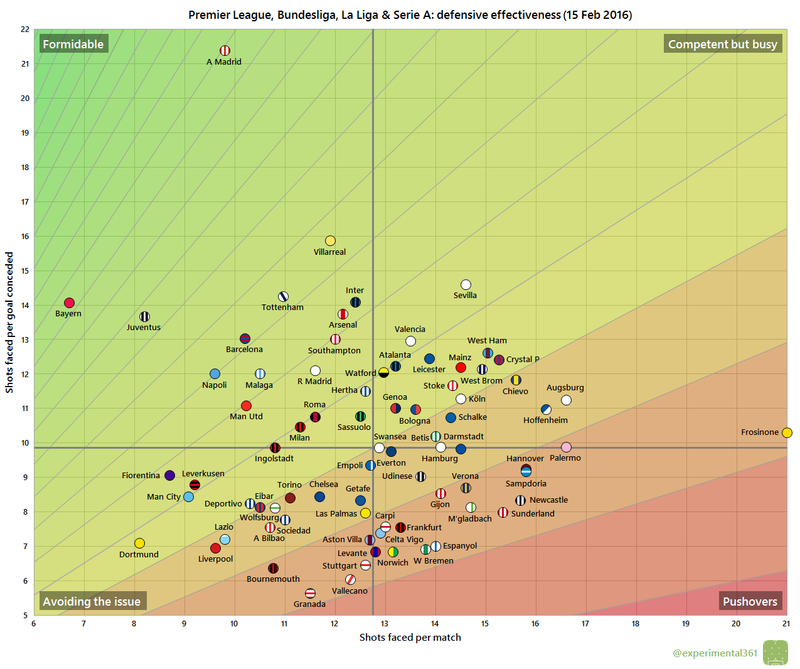 The likes of Barcelona and PSG are more clinical still, but tend to shoot less frequently. The most wasteful teams among this group have been Wolfsburg and Arsenal, who have created a relatively average number of chances but needed around ten attempts to find the net. The likes of Gent and Benfica appear not to experience much resistance in their domestic leagues, so it will be interesting to see how they would fare against some of the defences below. Both Atletico and PSG have soaked up an impressive number of shots for each goal conceded this season and should be incredibly tough to break down. PSG’s opponents Chelsea have had a relatively poor season at the back: they are alongside Wolfsburg in the bottom right and both were among the poorer performers on the attacking chart. Yesterday evening I also chucked data from the “big four” divisions onto one massive set of charts to see what would happen. While it’s pretty messy, it’s interesting to see which teams are equivalent across divisions. Bayern and Real Madrid lead the way as the two most dangerous attacks, while Tottenham have fared very similarly to Juventus and Dortmund have performed at the same level as Barcelona. Poor Ingolstadt‘s wasteful finishing is unrivalled across the big four divisions, with the next most wasteful side Udinese requiring almost four fewer efforts to score each goal. Both Villarreal and Hertha are flying high in their respective divisions despite taking very few shots: both have instead been very efficient at turning them into goals. We have massive outliers in three directions here. Starting on the left we can see that Bayern again stand alone with so few shots allowed, although Juventus aren’t far behind them overall. However at the top we can see that the number of shots absorbed by Atletico for each goal conceded is unrivalled and over five higher than the next most stubborn defence of Villarreal. At the far right we have Frosinone, who have allowed an average of 21 shots against them per match: over four higher than anyone else across the big four divisions. There are some interesting pairings here too: both Inter and Arsenal have performed similarly at the back, as have Man City and Leverkusen, with Lazio and Liverpool also not too far away in the bottom left.